over the weekend, my grandfather came to visit. my grandfather lives in arizona, so we rarely see him. recently, he has been visiting many of his relatives on the east coast, and on saturday he came up to our house for dinner. when i found out that he was coming, i started thinking about what i should make for dessert. here's a breakdown of how the thought process went in my head . . . grandpa >> british accent >> england >> love actually movie >> keira knightley >> banoffee pie. if you followed that without getting confused, high five! if your lost, here is my explanation . . . my grandfather has a british accent. every time i hear him talk, i think of england. whenever i think of england, i think of one of my all-time favorite movies love actually. keira knightley was in love actually, and there is a scene in love actually where keira knightley mentions banoffee pie. logical, right? moving on . 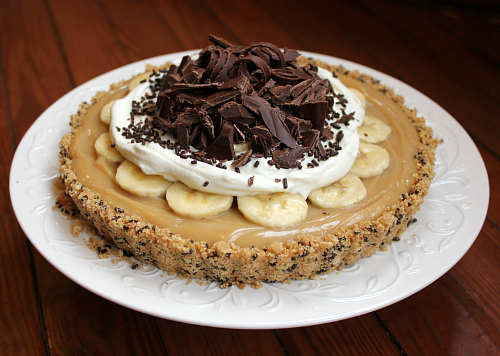 . . so, i decided to tackle banoffee pie for dessert this weekend. 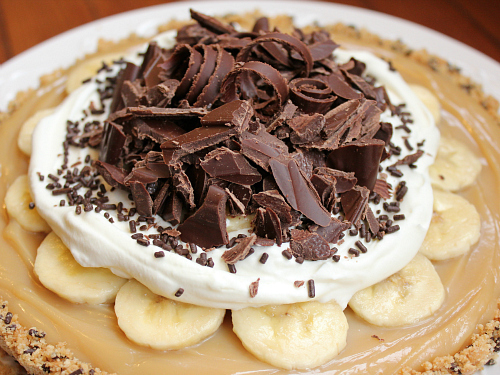 i had never had banoffee pie before, but it has always been on my list of things to order if i ever found myself sitting in a quaint little london cafe. since i don't plan on traveling to london any time soon, and since i was already going to have a man with a british accent in my dining room, i decided to bring london to me. 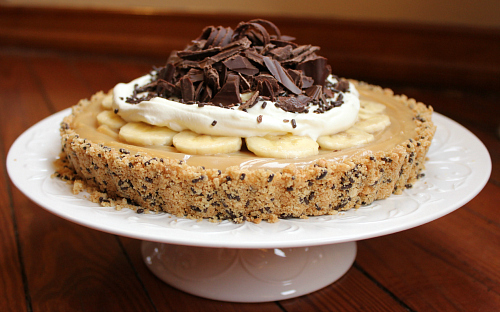 as it turns out, banoffee pie is incredibly easy to make. it is simple, it is sweet, and it makes you dream of london. it sure is messy and sticky, but it is oh so good. 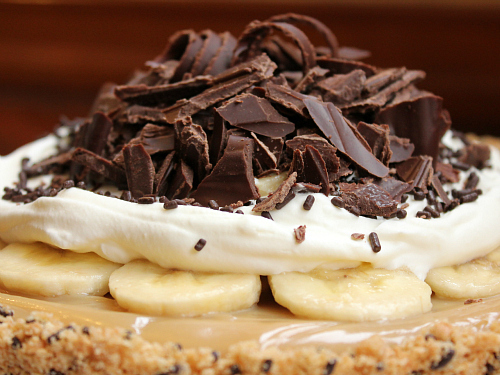 if you like bananas and toffee, this is the pie for you! to make the crust: in a large bowl, combine the graham cracker crumbs and the sprinkles. pour the melted butter evenly over the crumbs. mix together, making sure that all of the crumbs are evenly coated. pour the crumbs into a 9-inch tart pan or pie pan, and press the crumbs firmly against the bottom of the pan and up the sides of the pan, making sure that the crumbs form an even crust. chill the crust in the refrigerator until you are ready to use it. for the filling: slice one of the bananas and place it in a small bowl. toss the banana slices with half of the lemon juice to prevent them from turning brown. 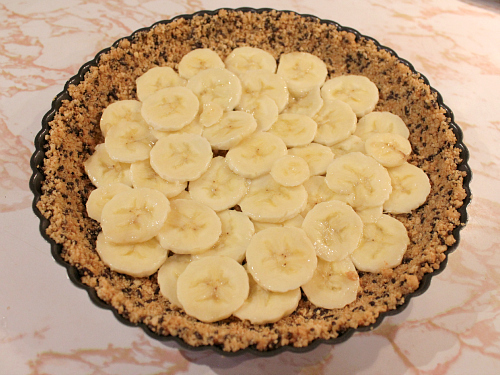 arrange the banana slices in the bottom of the crust, then return the crust to the refrigerator. in a saucepan, over medium heat, combine the butter, condensed milk, brown sugar, and corn syrup. stir until the butter has melted, then raise the heat to medium-high. bring the mixture to a gentle bubble, and allow it to bubble for about 3-4 minutes, stirring constantly. remove the mixture from the heat and allow it to cool slightly. stir well, then pour the mixture over the sliced bananas. chill for several hours or overnight. for the topping: slice the second banana and place it in a large bowl. toss the banana slices with the remaining lemon juice. 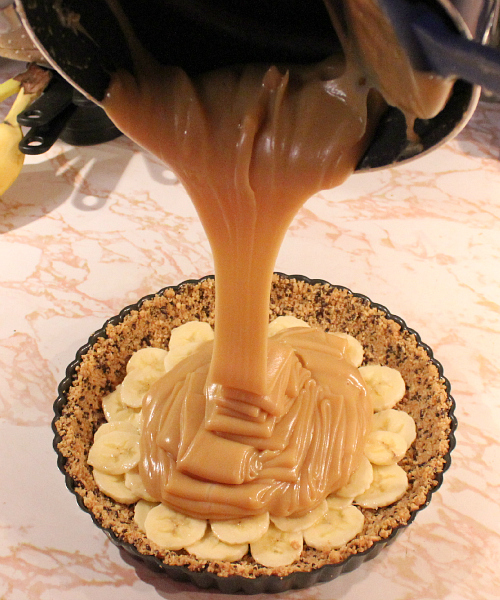 arrange half of the banana slices on the top of the pie. using an electric hand mixer, whip the heaving whipping cream in a large bowl until thickened and stiff peaks form. cover the top center of the pie with the whipped cream, and place the remaining banana slices on top of the whipped cream. decorate with chocolate curls, chocolate shavings, and/or chocolate sprinkles. keep refrigerated until ready to serve. i love how you came to the conclusion to make this! hilarious haha. and it looks so yummy :) your recipes always make me hungry! It really wasn't as sweet as I thought it would be. The presentation was nice with the shaved chocolate piled on top. 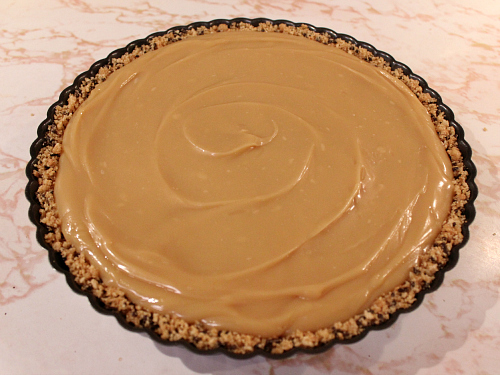 And your rationale for making the pie was completely understandable. I thought it was extremely yummy! I loved the toffee. Oh wow, this pie is amazing! I wish I could have a slice right now. Pinning and sharing on my Facebook page! How do you guys stay so skinny with all this yummy eatin??! !